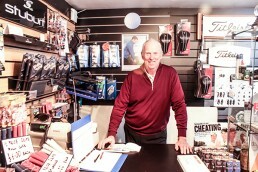 Our Pro Nev Hallam is well regarded, not only at the golf club but within the county as the Pro to go to for Custom Fit clubs and repairs. He has an ”AAT Advanced Professional” status within the P.G.A. As well as his club work Nev is one of only 10 Tutors, Examiners and Markers in the country working for the P.G.A. 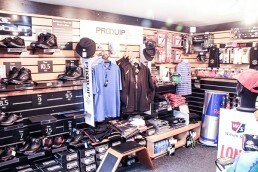 Training Academy, Equipment Technology Department based at the Belfry. 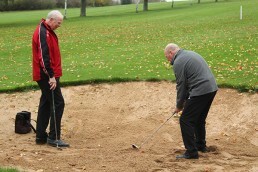 The Academy is responsible for the education of assistants in all aspects of Professional Golf. The equipment technology department covers, custom fitting, club design, manufacture and construction. Nev is also a lecturer for the Degree courses run in conjunction with Birmingham University. This takes him round the country from Scotland down to London and he is visited by assistants from around the world from as far afield as Hong Kong, Russia, Jakarta, China and of course all European countries. These Assistants come to him for refresher courses prior to their examinations, which are held at the Belfry throughout the academic year and cover all aspects of equipment technology. Once a question is asked on his subject he tells people he won’t be offended if after an hour or so they walk away rather than interrupt him. The British P.G.A. qualifications are regarded as the best and most thorough in the world, including America. The world leading club designer Tom Wishon, based in America, freely admits this to be true and contributes to the training at the Belfry. With over 38 years of experience it is little wonder his knowledge is sought after. of clubs. This is because all clubs and sets are hand built to your specifications not some assumed Mr Averages specifications determined by a manufacturer. We would all have our clothes tailored given a choice. This way you only buy what you need and as Nev says every club you carry should have some value to your game. Call or visit the shop whenever you can and be assured of a warm welcome. Don’t be put off if you are a beginner as that is the best time to get the correct advice.